The rules around whether your family would have to pay inheritance tax on your home, if you were to leave it to them in your will, have recently changed. In our article we explain the most common eventualities and how you can work out whether you’re able to avoid inheritance tax on your home or not. When do your children have to pay inheritance tax on your home? Inheritance tax is charged at a rate of 40% above the threshold of £325,000. Anything below this figure is taxed at 0%. This is referred to as the nil rate band. If your estate includes your home and you have children or grandchildren you’re leaving your home to, you are entitled to an additional tax-free allowance. This is called the “main residence relief” or family home allowance and allows parents to leave an additional £125,000 to their children/grandchildren. This means that as a home owning parent, you would be able to leave £450,000 to your children, without them having to pay any inheritance tax. It is important to be aware that the family home allowance only applies to parents leaving their estate to their children (including adopted and fostered children as well as step-children) and their grandchildren. The additional family home allowance will increase by £25,000 per year until 2020, when it will be set at £175,000. All qualifying parents are entitled to the family home allowance alongside the Inheritance Tax nil rate band. This means that whilst one parent could leave their children or grandchildren £450,000 tax free, if there are two parents they would be able to leave the same figure. In short, two parents owning a house together could leave the value of the house up to £900,000 to their children or grandchildren, without them having to pay any inheritance tax. Situations involving the family home allowance and inheritance tax can be quite complicated, so it really is imperative that you involve a solicitor who has the relevant qualifications (check whether they are STEP qualified and if you are unsure, ask). The family home allowance can only apply to one property. You must have lived in the property that you are leaving in your will for the family home allowance to apply. Your individual family home allowance can be transferred to your spouse or civil partner if you die first. 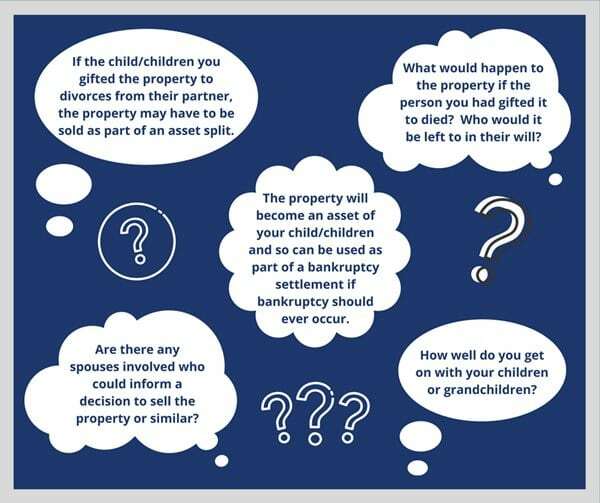 If you choose to gift your property to a child or grandchild rather than leaving your property in your will, there will be no tax-free allowance (and your child/grandchild may still have to pay inheritance tax, depending on considerations such as whether they or you were living in the property at the time). There is more about this below. Some or all of these points may be of interest to you. If you want to talk any of them through, please give our team a call. Can I gift my house to my children to avoid paying inheritance tax? If you choose to gift the family home to your children or grandchildren in your lifetime rather than to leave it to them in your will, there are a number of considerations to be aware of. Firstly, if you gift the family home to your children but continue to live there, it will remain part of your estate and so inheritance tax will still have to be paid when you die. This is the case regardless of what time in your life you made the gift, unless you pay rent. To officially pay rent, you would have to determine what the rent for your property would be at market rate and pay this to your children/grandchildren alongside a share of the household bills. This money will be subject to income tax for your children/grandchildren. The only exception to these rules is where you gift your property to your children and they begin living in the property themselves. Will inheritance tax change again? After this point, it is anticipated to rise on an annual basis in line with the consumer price index. The solicitors in our Wills, Trusts & Probate team all undergo examinations to become members of STEP (Society of Trust and Estate Practitioners). This equips us with the skills and knowledge required to expertly assist you when considering estate planning or alongside a probate.